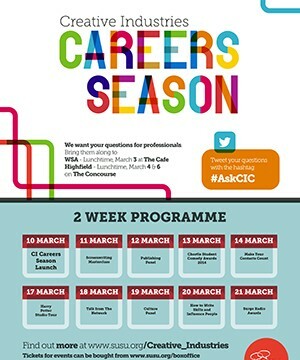 Creative Industries Career Season SUCCESS! For the first time, we have held our very own Creative Industries Careers Season! The idea spurred from the CV sessions that were held last year for performing arts students that many felt were very beneficial. Our current PA officer, Laura Ellis initiated a project to expand the idea over the whole Creative Industry zone. The career season lasted over two weeks and was packed with fantastic events, each chosen and designed around a survey that 145 students responded to. The students asked for events to help them build their skills in industries such as film, journalism, TV, visual arts, and publishing. Fourteen industry professionals attended, however it was especially exciting to have three successful, recent graduates from Southampton University to introduce the opportunities, to hopeful students of an industry that is diverse. In total, 10 events were held, including a spectacular tour of The Harry Potter Studio. Not only did the enthusiastic filmmakers get to go behind scenes and have the entire production process explained to them, but they also had the opportunity to see one of Hagrid’s costumes! Other events included a launch event that was presented by VPDCI, David Martin, a screenwriting masterclass designed to improve students’ creative writing skills, and a Culture Panel that provided excellent tips on how enter performing and visual arts. With a great turn out of 200 students attending the events, the Creative Industries Careers Season kicked off with a promising start to something that can become much more. The events that were designed around student’s desires were beneficial to all and we hope that more students will feel encouraged to get involved in next years season to learn more about the creative industry. We hope in the future that this idea will inspire students to implement more career projects in other zones to reach out to even more students – SUSU’s way of helping students to succeed in their careers!